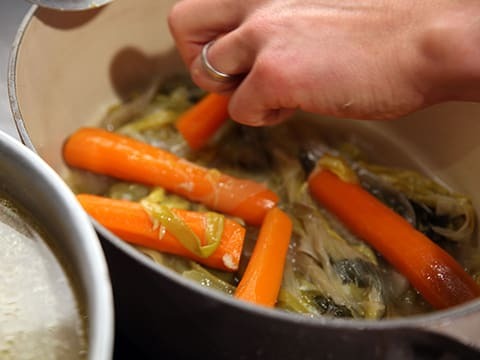 Poule au Pot was King Henri IV's favourite dish. 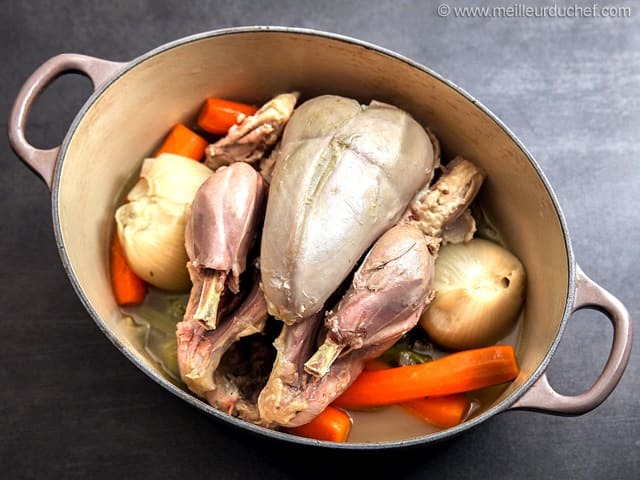 He once declared that every French family should be able to eat poule au pot, literally 'chicken in a pot', every Sunday. 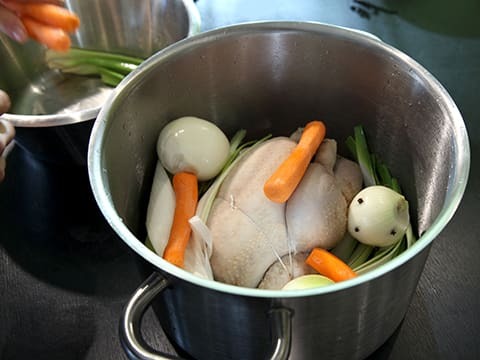 Before starting this Poule au Pot recipe, make sure you have organised all the necessary ingredients. 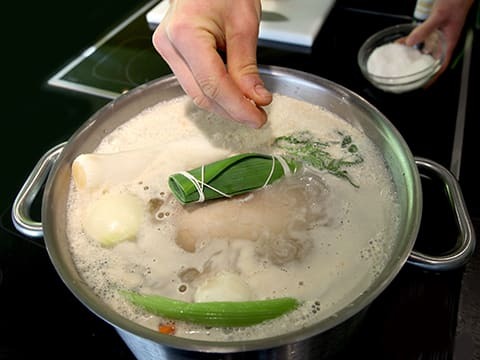 In a stock pot, immerse the chicken in a large volume of cold water and blanch. 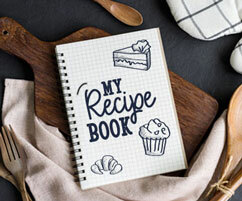 Bring to a boil and cook for 2 or 3 minutes. 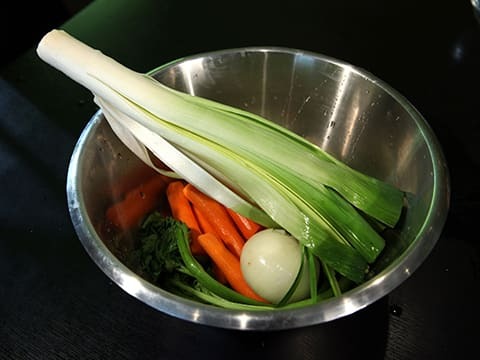 For the aromatic garnish: Peel and wash the carrots and the onions. 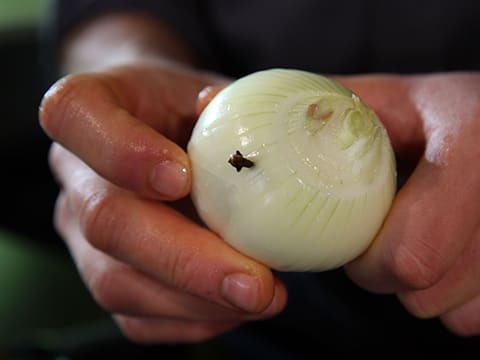 Stud one onion with the cloves. 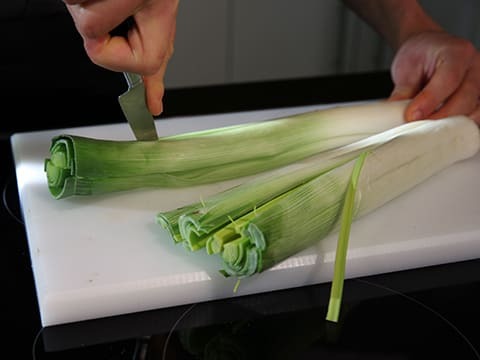 Slice the leeks lengthwise, then wash.
Do not cut the vegetables. ... and transfer onto a tray. Squeeze the juice of half a lemon over the chicken. 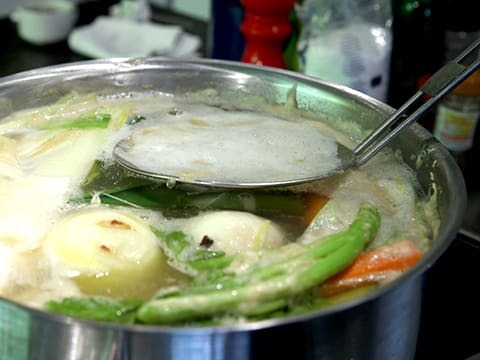 Empty the stock pot. 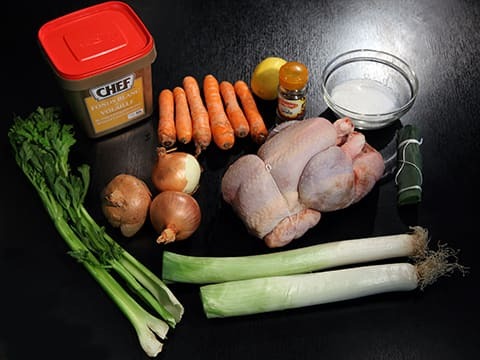 Place the blanched chicken and vegetable garnish at the bottom. 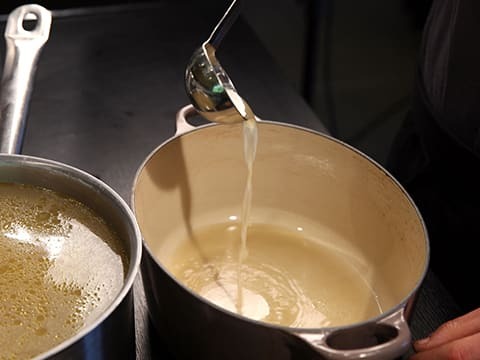 Make the chicken stock with 5 litres of water and 160 grams of chicken stock powder. Combine well and bring to a boil. 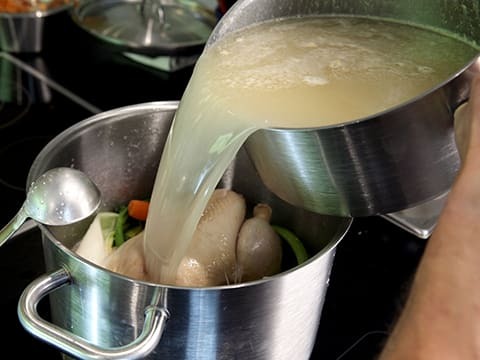 Pour the boiling chicken stock over the chicken and vegetables. 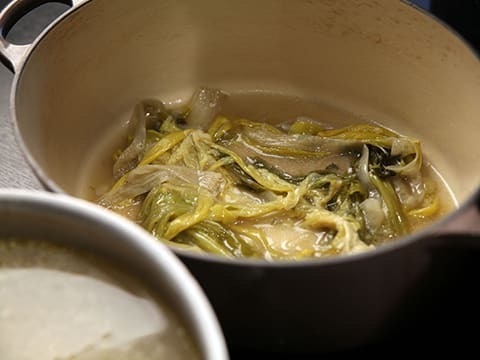 Add the coarse salt and bouquet garni. 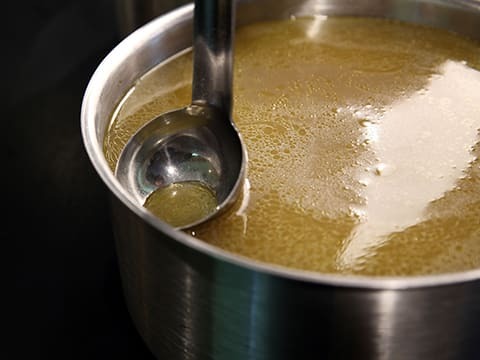 Bring to a boil and cook for about 2 hours without a lid. 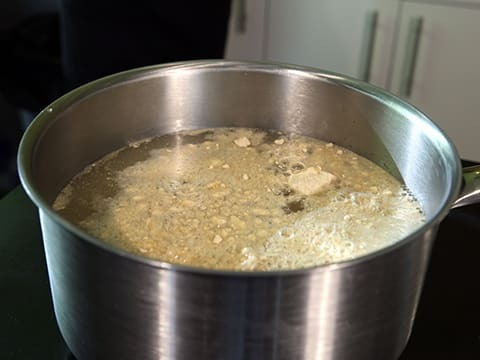 Regularly remove the fat on the surface with a skimmer, rinsing the skimmer under running water each time. 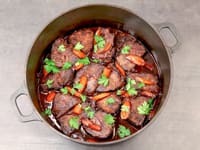 Remove the chicken from the pot. Strain well. 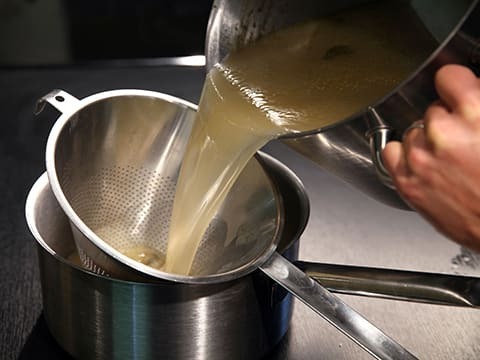 Pass the broth through a chinois. 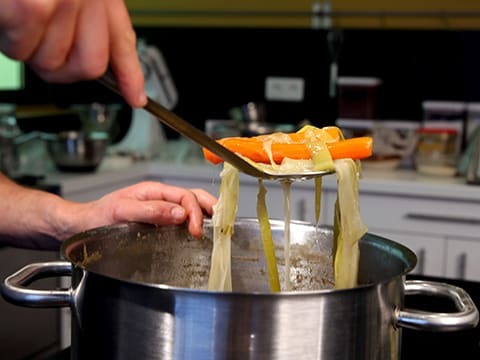 Skim the surface with a small ladle. ... followed by the carrots. Add two onions (not the studded onion with cloves). Remove the twine, then gently remove the skin from the chicken. The skin should come off easily. Arrange the chicken on top of the vegetables, then serve immediately.